Slip Slide and Away. A Really Long Way. When I was just a kid, I had a few cousins come to stay with us for a short period of time. I don't know all the details but I believe it was around the time that their parents were getting divorced. We weren't privy to adult details at that age, so we were kind of just told is that they were vacationing at our house for a bit. There were five siblings but only two were staying with us - this is a little tribute to their visit. I grew up on an acreage and my folks were pretty cool about letting us kill grass whenever we pleased. For example, the back portion of the property was overgrown and paths were mowed down for the dirt bikes. Well, these cousins were born city slickers and having more than a small yard to frolic in was unusual. I don't recall much of what we did during their stay... I think we played with our Atari but I'm not positive. 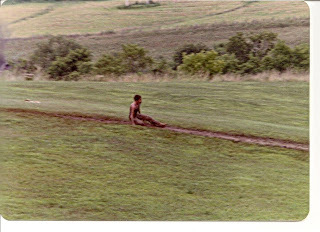 The only thing that I remember clear as mud is our homemade slip and slide. Who can claim creator of this new adventure to entertain all of us is beyond me. But here's the gist of it... We started with a very small piece of Visqueen (plastic) on the hill and started the hose. Each time we slid across the plastic, we progressed further into the grass. And further... and further. For all you current city slickers - beneath the grass is dirt. When dirt gets wet, it's mud. When five kids slide across it over and over and over it gets pretty messy. Messy but totally fun. We were out all day and my brothers and I finally came inside when it was time for dinner. We were so covered in mud that I'm surprised my mom let us back into the house. My cousins, on the other hand, stayed out until dark since this was a once in a lifetime experience for them. I'm sad to say that my cousin Shawn is no longer with us, but Karla is a grown woman with kids of her own. She happened to be in town last week with her two sons - the older about the same age as she was when she stayed with us. She traveled from Colorado to spend some time with our grandmother who is about to celebrate her 93rd birthday. Who would have guessed it, but my mom and dad decided to recreate the past. My dad picked up another roll of Visqueen then they invited everyone out to their place. My dad rolled out the entire sheet of plastic down the very same hill that we had massacred about 30 years ago. He even lined up two separate hoses to ensure enough water would run the width of the slide. It was a much cleaner version of what we had created when we were young but it was an amazing memory for the next generation. ...and thanks to the hoses and the tilled (but unplanted) portion of the garden - there was still plenty of mud to go around. A few weeks ago, I read a blog post from one of my blogger friends - chronicling her sorrows about difficulties with conceiving a child. It's not the first blog I've read that has been filled with despair. Each time, I promise them - or myself - that I'll share my story. It's difficult. It's emotional. I could never bring myself to do it. Until now. If the road to becoming a mother is bumpy, it's best to have someone riding shotgun. So I brought my notepad outside to write while surrounded by my ultimate inspiration. I laid on the ground and watched my girls playing with the sidewalk chalk. It made me smile and I realized how lucky I really am. In 1994, a year after we got married, my father-in-law suffered a heart attack. On the long drive from Iowa to Alabama (where he was hospitalized), DH and I discussed starting a family. It was a casual thing at first, figuring it would happen when it was meant to. We didn't get pregnant, but at the time, it was a good thing. We had the opportunity for DH to accept a job in Los Angeles and I doubt we would have taken such a risk if we had another mouth to feed. So we accepted the job and moved. We were trying but it just wasn't happening. In 1996, my brother emailed us a trivia question and said we needed to call to get the answer. The email simply said "A N U S". I quickly deciphered it to mean "Aunt N Uncle soon". (Turns out it meant Aunt Nicole Uncle S.) It was a difficult call to make, that's for certain. I doubt they had any idea to what extent I was torn between excitement for them and total hopelessness for me. Although my family knew we were TTC (trying to conceive), I had never shared the full extent of my situation. Between family and friends, I had heard all the comments "You're too young to have kids." "Just relax." "Get drunk, that always works." My heart was broken every time I received another birth announcement in the mail. It just was easier to keep to myself. By 1997, I finally decided it was time to consult a physician - during my next annual exam. He prescribed clomid...like every other OB/GYN on the planet. Like any good patient, I followed my doctor's instructions. He was the doctor so I had no reason to question his treatment plan. I had no idea that my OB/GYN was wasting my time, money and emotional well-being. Answer this. What types of sites were you surfing back in 1997 or even 98 or 99? I would venture to guess not blogs or even advice columns. The only 'support group' I found was at ParentsPlace - a division of iVillage. There were so few of us that we even had a gift exchange at Christmas one year. Information was scarce and details (about treatment options) were very limited. After a year and a half of clomid - which included various types and levels of progesterone support, I was encouraged by my ParentsPlace friends to get a referral to a reproductive endocrinologist (RE). I stopped the clomid and waited. My doctor was offended and not very helpful but eventually submitted the paperwork. If I had known then what I know now, I wouldn't have spent more than three or six months on clomid. That's one of the basic things that people learn now - Clomid has diminishing effects as each month passes. I'll spare the medical details behind the ineffectiveness of it. But I wasted over a year not realizing that I had no chance of getting pregnant. Each month I would be crushed, broken and hurt when my period would start and I would grieve for another failed cycle. When I finally got a referral, the RE performed tests and informed us that we were pregnant. That brief break from Clomid was enough for my body to recover back to normal. Unfortunately, in December 1999 I miscarried. Believed to be primarily due to undiagnosed and untreated hypothyroidism. All the weight I had gained was because of my thyroid. I blamed it on stress and clomid. My RE insisted I take some time off for my body to heal; when it was time to start again, I was told he was retiring. This time, I was referred to Dr. Tina Koopersmith. She started us easy but moved into Gonal-F. I never realized how difficult it would be to measure and prep for an injection at exactly the same time every evening. That meant any destination at that time of day would be my mobile lab. Airport, mall, restaurant to list a few. I looked like an addict getting ready to shoot up, but I didn't care... I had my priorities. All the Gonal-F shots were subcutaneous in the thigh, while the HCG shot was intramuscular in a small area on the backside of my hip. The Sub-Q shots were doable and I figured out a system that worked well for me. As painful physically as the HCG shot was, it was far worse emotionally for DH since he was saddled with the responsibility of administering it to me. In May 2002, we were on what we figured would be our final cycle because it was just too difficult and was causing me a great deal of mental anguish. I was bitter. I was angry. And I was taking it out on the person who mattered most to me in the world, my husband. If this cycle, which included Gonal-F and an Intrauterine insemination(IUI) didn't work, then we would not have children. On June 4, 2002 - After approximately 8 years of trying, countless dollars, daily temperature charting, ovulation predictor kits, a year and a half of clomid, enough arm pricks for bloodwork to turn me into a fountain, a very painful Hysterosalpingogram, a difficult uterine biopsy, months of daily thigh injections and related HSG shots, progesterone suppositories and creams, home pregnancy kits, blood sweat and lots of tears, Dr. Koopersmith called to inform us we were expecting. My father-in-law's birthday is June 3rd and his anniversary June 5th so we felt it was a gift that we get this call on the 4th. Unfortunately, my FIL had passed away the prior December. I had a high-risk pregnancy but after some problems during labor, delivered a healthy, happy Miss M. When my doctors recommended I start birth control, I proudly explained "I paid for this one. I'm not going to pay NOT to have another. If it happens, I'll be happy." In the fall of 2003, we asked the doctors to start our referral paperwork so we could start the process all over again. My physician would not process it until they confirmed Miss M didn't have health issues. One day in January 2004, a few weeks shy of Miss M's first birthday, I informed DH that Miss M was going to be a big sister. We were in shock - no fertility treatments. An awesome and easy pregnancy, about 30 minutes of labor and a healthy Miss K was in my arms. It was a long and painful road but well worth the journey. Where, Oh Where Has She Gone? Things have been a little berserk around her lately. This past weekend we had a garage sale so much of last week was spent preparing for that. We moved the vehicles out to the driveway so I could prepare and wouldn't you know... that huge storm we had last week dumped hail on us. We had to scramble and rearrange junk in the garage so we could get the vehicles back inside. Our summer vehicles don't have hail damage insurance on them. June. In Iowa. Hail. Umm yeah. Screwy weather. The day before my garage sale. Lovely. Oh, and DH had a car show on Saturday. Was cool because he won a trophy for best in his class. I already knew he was best and full of class but at least now he has a trophy so everyone else knows too. And we had to move the swing set from the neighbors house to ours since the new owners required it be removed prior to closing. We did that Friday, right after we closed up the sale for the day. Quite an exhausting day. The neighbors had a moving sale at the same time and left yesterday for their new home out of state. They were wonderful neighbors and I'm sad to see them go. Their family is going through a lot of hardship right now so it's been a sad time leading up to this. My computer went on strike because I only turned it on for all of about 5 minutes yesterday. The only action it has seen for the past week is when I printed garage sale pricing stickers out. I'm so far behind on my blog reading (and writing) that it's going to take me forever to catch up! And did I mention that somewhere along the line my sanity hitched a ride to anywhere but here? If it shows up at your place, please send it back. Just wanted to let everyone know that there's a lot going on and I'll post something as soon as I can catch my breath. In addition to details on how the garage sale turned out, I have pictures from the storm, of the new swing set and of my (still living) garden. I also have a story in "edit" mode (has been for over a week) that I need to wrap up and post. Thanks to everyone for hanging in there while I was away! Anyone Up for FREE Redbook or Parenting Subscriptions? Back in January, I posted about AdPerk. Go ahead and click over to read it... I'll wait. If you read my prior post, thanks! If not, that's okay too. It was written with more flair that this one but here's the gist of it: Basically, you watch some commercials on your computer and earn yourself credits for free magazines. I have received a Popular Science subscription as well as a Good Housekeeping one. They do come and I have not noticed an increase in spam in my email. Although you might want to sign up under a catch-all email like I do... just in case. Well, they finally added a few new offers to their list! Redbook and Parenting. If you have a few minutes - go check out AdPerk and score some free reading materials! Each night during tuck-in, my children are entitled to two songs. The first song is their choice. Either they select something for me to sing or they get to make up a song themselves. The second song is always mine to choose. Well tonight was "K Day" which meant Miss K got tucked in first but Miss M was there to help. Miss K decided that she wanted to make up a Princess song and proudly claimed "I'm going to sing about Princess K and Princess M... (rolling her eyes and cocking her head like she's thinking) and love... and cheddar." Somewhat befuddled, I repeated. "Love and cheddar?" Miss K nodded and said "Uh huh." Miss M chimed in. "Each other. Love each other." "Ohhh. Love each other! That sounds like a great song." ...and it was. Thank goodness for 5 year old translators. Update: When I checked on 6/8, it said the supply had been depleted. I don't know if they'll restock but it's worth checking! I follow a few message boards that post links to free coupons and offers. Usually I enter my information and wait for the stuff to come in the mail. Just recently, I realized that some of my readers are just as frugal as I am and probably would love to take advantage also! Dole Food Company is offering a coupon for a free Distinctively Dole salad to the first 10,000 people who register. Among the choices are Asian Island Crunch, Ultimate Caesar, Southwest Salad, Perfect Harvest, Hearty Italian and Summer Salad. Here's the fine print: NO PURCHASE NECESSARY. FREE Distinctively Dole™ Salad coupons available while supplies last. Maximum coupon value $4.49. Product subject to geographical and retailer availability and to terms and conditions printed on the coupon. Limit one FREE Distinctively Dole™ Salad coupon per household. Please allow 6-8 weeks for coupon delivery. Not responsible for lost, late, misdirected, incomplete or illegible mail. Good only in the U.S. Void where prohibited, taxed or restricted by law. This is an offer of Dole Fresh Vegetables, Inc.
You'll receive an email - I got mine immediately - and you need to make sure you hit the confirm button in the email! I don't recall ever owning a green thumb. Whenever my mom would buy me a houseplant, she would make her selection based on how easy it was to take care of. I specifically recall the peace lily that she gave us when we moved into our first house. That thing had more lives than a cat. So a lot of my procrastination with building a garden, was based on fear. Not only that I might kill stuff and give DH and everyone else more ammo to make fun of me but more seriously, I feared it would all be a waste of money. That's precisely why I'm in shock right now. You'll never guess what I found when I walked out to check on my garden after our torrential downpour yesterday. Maybe I should rephrase that... you probably did guess since I posted a friggin' picture right at the top of the post. 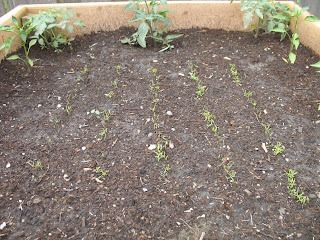 Although the back row of each bed contained tomato plants that weren't from seed, each box also had a few rows of seeded vegetables. 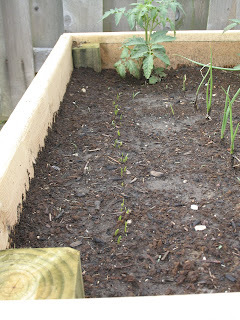 The single row on the left side of the bed in the first picture hopefully will grow to be spring onions. The second picture clearly shows enough carrots to make even Bugs Bunny happy. Yippee! I haven't killed them yet! Although it may not seem like much, for me it's a huge success. I know there is still a long way to go, but I'll take it one step at a time. When it stops raining, I plan to thin the rows to give them some growing room then cross my fingers for them to continue their positive progress! Think maybe I'll stop by the store and pick up a new watering can and maybe some new garden tools. All that's left is to figure out where I go to upgrade my thumb from my previous totally-brown color to my newly earned mossy green-brown.